Happy Friday from your favorite source for all things global health security – from Anthrax to Zika, we’ve got you covered…like germs on a kitchen sink! If you’re hoping to catch the Washington D.C. fireworks over the holiday, check out this article regarding the state of D.C.’s preparedness for anything from traffic issues to lone-wolf terrorism. You can also get some insight into the Strategic National Stockpile via an interview with the director of the program, Greg Burel. Ever wonder the economic impact of a pandemic influenza outbreak? A recent study analyzed the consequences of such a health emergency. Who Isn’t Equipped For A Pandemic or Bioterror Attack? Annie Sparrow of the Bulletin of the Atomic Scientists asks this question and points to the sad reality that the WHO is the front runner for this unfortunate title. Pointing to the origins of the WHO in the days of the early cholera epidemics, Sparrow notes that despite WHO claiming they were a catalyst for multilateral cooperation, the reality is much less prestigious. “But in fact, the first six International Sanitary Conferences were entirely unproductive due to conflicting interests: government fears about losing profits from trans-Atlantic trade took priority over the need to reduce the international death toll. Consensus was achieved only at the seventh conference in 1892, after the opening of the Suez Canal for use by all countries made standardized quarantine regulations necessary.” The slow WHO responses to Ebola and then Zika brought attention to the discrepancies between the WHO’s role as a front-line defense for pandemics (and bioterrorism) and what was actually happening. Many have called for a reform of the WHO and the necessity to address systemic and deep-rooted problems within the organization. Sparrow hits on several key obstacles the WHO needs to overcome if it’s going to truly serve its purpose – “increase its financial resources, eliminate the undue influence of donors and member states, and redress its subservient relationship with governments who are themselves responsible for health crises.” The WHO must also address its practices when dealing with health issues in conflict zones or transitioning states. Lastly, Sparrow highlights the suggestions that transferring global health programs to the UN would not be beneficial, but rather there needs to be a push for rehabbing the WHO. In the end, the world aspect of the WHO needs to provide some muscle behind this work, especially in times of political assertion of sovereignty. While we’re on the subject of WHO emergency response, it was recently announced that Peter Salama was appointed as the leader for the health emergencies unit. The Australian epidemiologist is currently with UNICEF in the Middle East and North Africa, but will lead the new team that was established following criticism of the WHO’s response during the West African Ebola outbreak. The new unit was set into place to provide rapid (not rabid…but there’s some infectious disease humor for you), support to a country or community experiencing a “health emergency arising from disease, natural or man-made disasters or conflict”. The WHO website has more information here, regarding the Health Emergencies Programme. Unless you’ve been vacationing in a remote part of the globe, the Brexit referendum has been taking over the news. The British vote to leave the European Union (EU) has set into motion a global wave of economic uncertainty. While many are discussing the financial, trade, and labor force implications of the Brexit, there are also far-reaching public health outcomes. Just prior to the vote, an article was published in the Journal of Public Health regarding the impact of the EU laws on public health. Aside from environmental issues ranging from water quality to emissions, the EU has also focussed on tobacco cessation. The EU has developed strong skills for information exchange to better support a healthy public. “The EU has provided continued bold and effective action on public health policy and designed an excellent funding framework for collaborative health research. The loss of the UK’s strong participation and policy voice in the EU would, as Lord Hague, the former Conservative Foreign Secretary, recently quipped ‘not be a very clever day’s work’.” While globalization makes the spread of disease easier, it would make the new British isolation extremely impacting. The isolation via Brexit could create issues regarding cross-border information sharing, which becomes especially vital during outbreaks or in cases of public health emergencies. I was recently gifted (as a joke) this amazing device to fend off the Zika-carrying mosquitos…what could possibly go wrong with an electric zapping racket? University of Michigan researchers performed an analysis looking at the political response to Ebola and how that may bubble over to Zika management. Reviewing the U.S. response to Ebola they looked at the “fragmented system with no clear leadership and considerable ‘strategic politicization’ due to the outbreak’s arrival during a midterm election year.” Scott Greer of the U-M School of Public Health noted that “Republicans are going to continue not to give Obama the federal dollars he seeks to combat Zika. They don’t trust him. But when the virus starts to affect people anywhere south of Indianapolis there will be an elaborate game of blaming the administration for not doing it right.” Good news- Cuba recently announced that they have had no Zika transmission since March and Dengue is all but eliminated due to their wide-spread, military supported fumigation efforts. New studies are looking to the efficacy of Zika transmission via urine and saliva as a research team from Brazil’s Fiocruz Institute isolated live virus from such samples. U.S. Zika funding is still in limbo as Senate Democrats derailed the $1.1 billion bill on Tuesday over “objections to attached measures such as birth control restrictions.” Florida health officials reported microcephaly in a baby born to a woman from Haiti. Researchers are also finding that microcephaly may be just the tip of the iceberg, as findings suggest other developmental delays in babies born without microcephaly. There is also concern for the impact of the Zika on fetal brain tissue, causing cell death. Despite the hold-up on Zika funding, the U.S. National Institute of Allergy and Infectious Diseases has started work on a research study regarding the mechanisms that allow Zika to be sexually transmitted. As of June 29, 2016, the CDC has reported 935 Zika cases within the U.S. Stopping Lab-Created Global Disasters One Scientist at a Time – Biotechnologist Kevin Esvelt talks about the shaky future of genetic engineering technologies like CRISPR. Esvelt notes, “We are walking forwards blind. We are opening boxes without thinking about consequences. We are going to fall off the tightrope and lose the trust of public. Lots of people are going to die.” Since he and his colleagues first suggested, two years ago, that CRISPR could create gene drive, he has been working hard to warn how dangerous the technology is. One Health and the Politics of Antibiotic Resistance– Check out this webinar on July 7, 2016 from 11am-noon EDT. Dr. Laura Kahn will discuss the rise of certain MDRO’s, the different policy approaches in Europe and the U.S., and the history behind low-dose antibiotic use in agriculture. Healthcare Worker Gloves and Disease Transmission– Researchers recently revealed results from a study reviewing “cross-transmission rates between contained gloves of healthcare workers and hospital surfaces.” Not surprisingly, results showed that contaminated gloves increased the likelihood of transmission among healthcare workers and in the environment. Happy Infection Prevention Week! Make sure to give any infection preventionists you know a big hug or at least a hearty handshake (only clean hands though!). Not only do we get to celebrate National Infection Prevention week, but it’s also National Biosafety Stewardship Month, so get your party hand sanitizer ready to go and let the frivolity begin! Foodborne illness is the name of the game this week and we’ll be discussing outbreaks. Friendly reminder – the influenza vaccine is available in most offices/clinics now, so get your flu shot as there have already been cases springing up across the US. Fun fact – did you know that a report published this week identified Yersinia pestis in the tooth of a Bronze Age individual, which means there were plague infected humans 3,300 years earlier than we thought! National Biosafety Stewardship Month – October is National Biosafety Stewardship Month (thanks NIH!) to celebrate and encourage people to focus on biosafety policies, practices, and procedures. Given the lab biosafety issues we’ve seen recently, I think we can all safely (or should I say, “biosafely”?) agree that a little extra attention to these issues and the promotion of better practices is a great thing. Institutions are encouraged to use more of a just culture approach to incident reporting and to promote public transparency. Happy National Biosafety Stewardship Month! The 2016 Summer Olympics are fast approaching and with any large event, health issues become a main concern. The WHO is providing technical advice to the Brazilian national authorities regarding public health concerns, as well as to the International Olympic Committee and the Local Organizing Committee. Clean drinking water, sewage pollution, and a host of other health issues can become a nightmare during such a large-scale event. While there aren’t recommendations for specific viral testing of the water, the WHO does encourage additional testing in the event of an outbreak. Sanitary inspections and other preventative procedures are being recommended to avoid outbreaks and public health issues. As we get closer to the 2016 Olympics, it is very likely concerns over vector-borne diseases will be addressed through vector control and public health education. The CDC has updated their online foodborne illness outbreak investigation tool! The Foodborne Outbreak Online Database Tool (FOOD Tool) allows the user to search the outbreak database by state, food, ingredient, year, location of food preparation, and organism. The FOOD Tool also provides the case information related to the outbreak, so users can see the number of affected persons, hospitalizations, deaths and laboratory-confirmed organisms. This database pulls from CDC’s Foodborne Disease Outbreak Surveillance System (FDOSS) and allows users to not only look at data and trends over time, but also compare their cases to other outbreaks. Dr. Trevor Thrall, one of our amazing GMU Biodefense professors, has written a piece for The Atlantic on the importance and benefits of taking in all Syrian refugees. Dr. Thrall discusses the limitations of addressing the root cause of the Syrian conflict and how the US and its European allies should take in refugees. Discussing the military alternatives to the Syrian crisis, he states, “going in militarily is not the answer, then. Instead, those civilians under threat should get out. Refugees typically receive support in the countries to which they flee, but the vast numbers involved in this case threaten to overwhelm Turkey, Jordan, and Lebanon, which have so far accommodated the vast majority of the outflow.” Dr. Thrall points out that while resettlement would cost a substantial amount of money, it would cost far less than military intervention and you simply can not ignore the moral superiority in aiding refugees. To our readers in Minnesota, did you happen to eat at a Chipotle in August? If so, we hope you weren’t one of the affected individuals that contracted Salmonella Newport as a result of contaminated tomatoes. The Minnesota Department of Health investigated the 64 cases resulting from this outbreak, however it was just released that the contaminated tomatoes were actually supplied by Six L’s Packing Co (doing business as Lipman Produce), which is actually one of the largest tomato suppliers in the US. Packing 15 million boxes of tomatoes this past year, Lipman was later dropped as a supplier by Chipotle after learning of the source of contaminated produce. The tomatoes were removed but it’s estimated that during the window of exposure, roughly 560,000 people consumed Chipotle. The good news is that we’re out of the incubation period, so if you happened to eat at a Minnesota Chipotle, you’re in the clear. 80 Illnesses Linked to Shigella Outbreak; CA Seafood Restaurant Closed – Mariscos San Juan in San Jose, CA is currently closed after the Santa Clara County Health Department connected a recent outbreak of Shigella to their food. While the exact source hasn’t been identified, over 93 people were sickened in relation to contaminated food at the restaurant. Subway to Phase Out Poultry Products Raised With Antibiotics– On Tuesday, Subway Restaurants announced that they will be transitioning to only serve poultry products that have been raised without antibiotics by early next year. Other chain restaurants, like Chick-fil-A and Chipotle, are jumping on the train to phase out chicken and turkey products that were raised with antibiotics. Scottish Nurse and Ebola Complications – Pauline Cafferkey continues to battle post-Ebola complications. Reports last week noted neurological issues and it was recently reported that she has meningitis after the virus persisted in her brain and CSF after her initial recovery. Ongoing research is looking into the long-term effects of the disease as the West African outbreak was the largest in history and researchers have never had the opportunity to look at chronic issues associated with disease recovery. What a busy week in the world of biodefense! First, let’s give a round of applause for Global Handwashing Day (and now, go wash your hands!). This week we saw a nurse from the UK experience Ebola-associated complications months after her recovery. The CDC released a report stating that 17 states exceeded their recommendations for Ebola screening/monitoring and a recent study discussed vaccination rates and herd immunity. Let’s not forget that we’ve got another segment on 2016 Presidential candidate chatter on nonproliferation, a call for papers, and an open house on GMU’s Master’s program. Grab your morning coffee/tea and let’s explore this week’s biodefense news! Global Handwashing Day was Thursday, October 15th, but really we should be celebrating it every day! It may seem like a simple thing but the truth is that hand hygiene is one of the most important things you can do to prevent the spread of infection. Whether it’s a hospital-acquired infection or avoiding illness in the workplace, hand hygiene is the first line of defense. The WHO estimates that hand hygiene, just in healthcare, saved millions of lives in the last years. The CDC even calls it the “do-it-yourself” vaccine – five simple steps (wet, lather, scrub, rinse, dry) to help prevent the spread of infections. Many people think it’s a small or “easy” thing, but coming from an infection preventionist, it’s the small things that make the biggest difference. You’d be surprised how many organisms we carry around on our hands and on fomites, so using alcohol-based hand sanitizer or washing with soap and water is the only way to get rid of those. University of Arizona professor, Dr. Gerba, (we lovingly referred to him as Dr. Germ – funny enough, he even gave one of his children the middle name of Escherichia!) has focussed much of his research on the household and public objects we may not realize are covered in germs. Perhaps the most important take-away from Global Handwashing Day isn’t just its importance in healthcare, but its role as an important part of disease prevention everywhere. In the U.S. we’re fortunate to have access to the resources that allow us to have phenomenal hand hygiene practices however, it’s the behavior we tend to fall short on. From today forward, I encourage you to make a personal decision to be vigilant in hand hygiene. Last Call for Papers – Women’s Health in Global Perspective! Papers sought for a special issue and workshop of World Medical & Health Policy on “Women’s Health in Global Perspective,” to contribute to understanding and improve policy related to women’s health and wellbeing. Forces ranging from the economic to the climactic have human repercussions whose genesis and solutions demand consideration of their global context. A wealth of recent research and inquiry has considered the particular plight of women, who often suffer disproportionately from lack of education, compromised nutrition, poverty, violence and lack of job opportunities and personal freedom. The Workshop on Women’s Health in Global Perspective will consider the broad ranging social determinants of health on a global scale that importantly influence health outcomes for women everywhere, which in turn has implications for economic, political and social development. GMU’s Greg Mercer has put together a wonderful second part to his series on one of our favorite topics (nonproliferation) and what the 2016 presidential candidates are saying about it. Check out Greg’s review of these candidates’ stance so we can track how they might change over the course of the election. 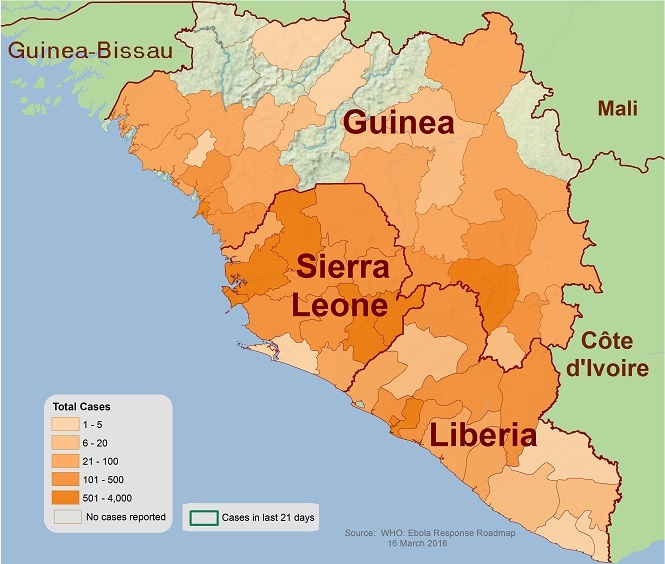 BBC recently published a nice overview of the Ebola outbreak in West Africa. Since the first case 18 months ago, it has been a whirlwind, in more ways than one, for those of us in the public health/global health security world. Cheerfully, the outbreak region has officially gone two weeks without a new case! Unfortunately, Pauline Cafferkey, the Scottish nurse who was treated and recovered from Ebola in December of 2014, is in critical condition due to a late Ebola-related complication. It was just released that her complications are neurological, including severe central nervous system (CNS) disorder and that the virus was detected in her spinal fluid. Scottish public health officials did identify 58 close contacts and offered them the SV-EBOV vaccine. Learn more about the GMU School of Policy, Government, and International Affairs Masters’ programs on Wednesday, October 21, 2015 at 6:30pm at our Arlington Campus, Founders Hall, Room 126. This informational sessional will discuss our Master’s programs ranging from Public Administration, Biodefense, Political Science, Health and Medical Policy, etc. Imported Measles and Need for Vaccination –This past week at the IDWeek 2015 meeting, scientists reported on a study reviewing measles vaccination rates in the US and susceptible children in relation to the number of measles cases that have occurred. They noted, “this analysis highlights the need for high measles vaccination coverage to support population-level immunity and prevent reestablishment of indigenous measles transmission in the United States.” The Daily Beast also incorporated this into an article on diminishing herd immunity and anti-vaxxers. International Infection Prevention Week is next week! October 18-24, 2015 will celebrate the importance of infection prevention and control in healthcare. Let’s celebrate by not just washing our hands, but also considering all the small ways we can prevent the spread of germs in our homes and workplaces! Salmonella Cucumber Outbreak – The CDC has released new data on the Salmonella Poona outbreak related to imported Mexican cucumbers. As of October 14th, there have been 757 people infected across 36 states and 4 deaths related to the outbreak. DHS Wants to Revive Terrorism Alert System – In wake of the attacks in Chattanooga, President Obama’s security officials are initiating a review of the nation’s terrorism alert system to support what many consider a growing threat of domestic attacks. DHS wishes to revise and restart the National Terrorism Alert System to better respond to these evolving attacks.